Join the characters you know as you will never recognise them. Their homeland is gone and in Fabletown, New York City, the Fables must keep themselves to themselves. When Rose Red goes missing and her apartment is covered in blood the mundy cops must not be informed. Its up to The Big Bad Wolf to solve the case, along with Rose’s sister Snow White, and keep the Fabletown community from coming apart at the seams. Fables has been on my wish list for a very, very long time. Thankfully a christmas present helped me on the way towards reading them when it turned out to be the first volume. I am utterly useless though because it then took me until August to finally get round to reading it, and damn why didn’t I read it sooner?! I’ve always heard good things about this series and I am happy to say I agree with them. It is brilliant and well worth a read. I loved the way it takes characters we know from fables and fairytales, and makes them into real characters. The gritty atmosphere you pick up from the graphic novel obviously comes from the darker side of some of the stories, as we all know the originals were not nice stories like Disney has turned them into. That darkness transfers to the characters too with the mild, meek women coming across as pretty badass and even the men who are seen as ‘heroes’ in the original stories, having some serious flaws. I think my favourite portrayal was Prince Charming and his womanising ways… serious he was there for them all! There were a few references I didn’t know because my knowledge of fables and fairytales isn’t actually that vast but Fables didn’t allow for that fact to me off. It is its own take on the characters with a fantastic storyline that kept my attention right to the end. I loved the way it showed the little clues as to what had happened to Rose Red throughout the book and then how it was revealed at the end. Its not often I come across that kind of thing in the books I read so it felt like proper crime scene tv show or movie! I struggle to actually review graphic novels because obviously the images are such a big part of the story and I have no technical knowledge of the images used. I know I like them but cant really go into details as to why a lot of the time. The ones in Fables really grabbed me because of their attention to detail though and I loved that the character’s shadows show up more like their true fable rather than how they looks, for example the Big Bad Wolf’s shadow is a wolf even though he is a man in the story. One thing I wasn’t expecting from Fables: Legends in Exile is the story at the end. The short story ‘A Wolf in the Fold’ by Bill Willingham was amazing and was so special. The writing was incredible and I loved what insight it gives into the character of the Wolf. I think it added so much to the graphic novel, which was already pretty immense in my eyes, and I also liked the mini strips at the back too. All bonus things that I didn’t expect and really enjoyed from this volume. I am kinda kicking myself for not reading this sooner but also for actually reading it because now I want the rest of the volumes and I don’t have them… I know whats next on my to buy list at least! 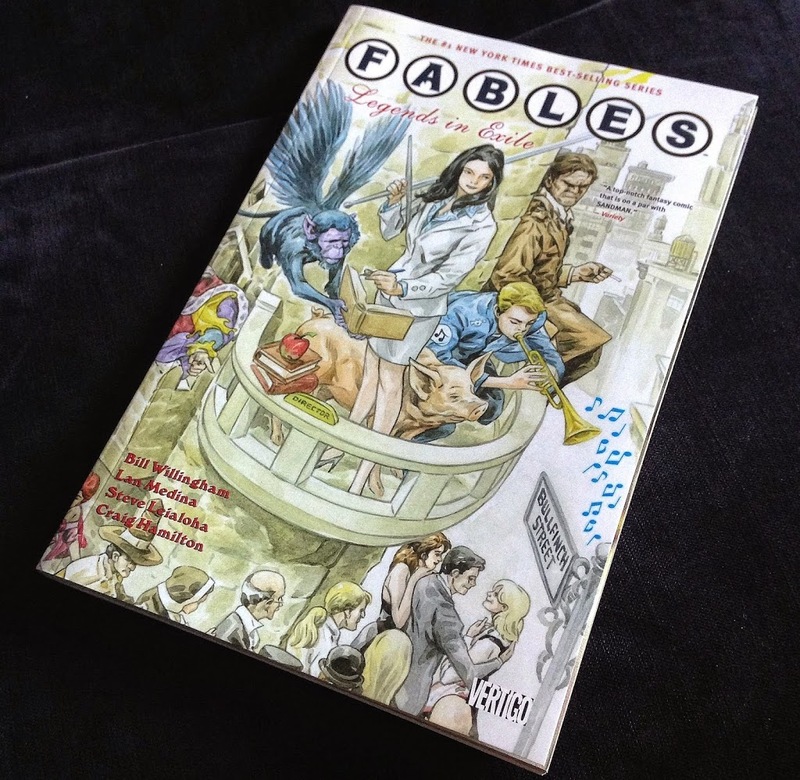 Fables: Legends in Exile was published by Vertigo in 2012. my copy was given to me as a present.